At the end of his turn, Chen Lin can place any hand card on another character. At the beginning of this character's turn, they must give Chen Lin one hand card of the same type (basic, tool, or equipment). If they do not, they suffer one unit of negligence damage. If they give Chen Lin a card of the same type, they keep the card that Chen Lin placed on their character card. During his action phase, Chen Lin can target any character whose hand card number differs from their current health level. If they have more hand cards than health, they must discard two cards. If they have more health than hand cards, they draw two cards. Chen Lin can target each character once per game. "Propaganda" can only be activated after Chen Lin's discard phase. Remember that the damage caused by "Propaganda" is negligence damage. Chen Lin is not considered to be the source of this damage. The card that Chen Lin places on another character via "Propaganda" cannot be removed via character abilities, Breaks, or Steals and it cannot be viewed until the beginning of the target's turn. Targets of "Propaganda" cannot give Chen Lin equipped cards. The card that they give Chen Lin must come from their hand. When Chen Lin targets another character with "Propaganda," they must resolve this ability (by giving Chen Lin an appropriate card or suffering negligence damage) before their judgement phase at the beginning of their turn. If Chen Lin dies before a "Propaganda" card goes into effect, the targeted character cannot give Chen Lin one of their hand cards and is forced to suffer negligence damage. 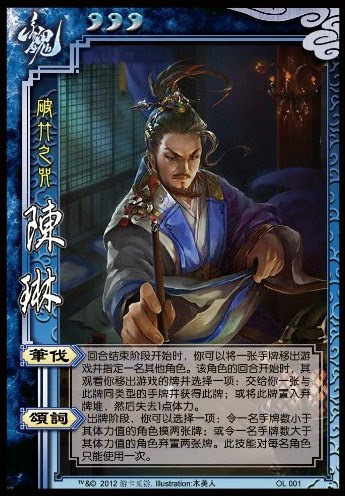 Chen Lin can activate "Eulogize" as many times as he would like during his turn (so long as he has targets that meet the criteria for this ability). Chen Lin can target himself with "Eulogize." When Chen Lin targets a character with more hand cards than health with "Eulogize," the target chooses the cards to be discarded. They can choose to discard hand cards and/or equipment cards, but they cannot discard pending delay-tool cards in their judgement area. "Propaganda" can be an extremely potent offensive ability, especially if Chen Lin places equipment cards on the enemy character's character card. Most players (logically) place their equipment in their equipment area or discard unwanted equipment at the end of the turn, so unless they are specifically planning for this possibility, it will be unlikely that they will be able to prevent negligence damage. The same logic can be applied to the use of tool cards in this manner, though it is more likely that an enemy could avoid damage by giving Chen Lin a Negate. Because "Propaganda" deals negligence damage, it is excellent against characters with powerful damage-activated or retaliatory abilities. "Eulogize" is useful gives Chen Lin and his team a 2*X card advantage over the course of the game (where X is the number of players in the game), assuming he uses this ability on each character in a way that is beneficial to the team before he dies or the game ends. Chen Lin literally has no defensive options. With only three units of health, he can be killed incredibly quickly. "Propaganda" can only be activated after Chen Lin's discard phase, meaning that he must end his turn with fewer cards than his current health limit. This makes him even more vulnerable to enemy assaults, especially if he is already low on health. If an enemy avoids damage from "Propaganda," they get to keep the card that Chen Lin placed on their character card, resulting in no net loss of cards. "Eulogize" is a nice ability, but it is limited in its usability since it can only be used once per character per game. Yuan Shu/Yuan Shao/Xun You/Zhuge Ke/Liu Bei - These are examples of characters that run out of hand cards quickly. If they are on Chen Lin's team, he will have an easy time of activating "Eulogize" on them to help them. If they are on the opposite team, Chen Lin will encounter difficulty when trying to find an instance in which they have more hand cards than units of health so he can use "Eulogize" offensively on them. Dian Wei/Zhang Fei/Guan Yu/Xiahou Yuan/Xu Chu/Pan Zhang & Ma Zhong/etc - These are examples of characters with powerful offensive abilities. Due to Chen Lin's limited defensive options (especially after he uses "Propaganda"), they have the potential to kill him quickly. King Chen Lin is a risky king choice. With a little health and no defensive abilities, the rebels can kill him quickly. Loyalist Chen Lin is a good loyalist pick. "Eulogize" can be used to give him and the rest of the king's team a card advantage and "Propaganda" can be very damaging to rebels, especially those with damage-activated abilities. Rebel Chen Lin is a good rebel pick. Again, "Eulogize" can be used to help his team and undermine the king's team and "Propaganda" can give the king headaches. Spy Chen Lin is a risky spy pick. It is possible for him to keep the game balanced with his abilities, but his lack of durability may make it difficult to last until the end of the game. The release of Chen Lin was an excellent way for YOKA to return to the original SP series. His abilities are not too confusing (though he is definitely an advanced character) and he seems well balanced. Additionally, he is unique and interesting to use. When using him, be sure to use "Eulogize" on all of your teammates and your opponents in the correct way as quickly as possible. Enemies with damage-activated abilities should be your first priority when choosing targets for "Propaganda." Also remember that enemies with no hand cards cannot avoid damage from this ability.